When I go about choosing a character to cosplay, I like to pick characters I admire or relate to, but really you can be whoever you want. The cosplay community is incredibly supportive and accepting, so whoever you decide to be, remember to have fun! So don't be scared to be weird. The thing about picking a fun character is that you usually have fun putting it together. For characters like Bulma, I suggest taking a trip to thrift stores and seeing if you can find articles of clothing, even props that are close to your character, then customizing them to make them as accurate as possible! Sometimes this works out perfectly, and it's the least expensive route. When going about starting a more complicated costume, what I first like to do is draw out my plans. For Kaneki, the character is male but I wanted to create a female version. I like to gather ideas from other peoples creations and take notes! Once you have a plan, the next step is taking a trip to Joanne Fabrics and going crazy. TIP: Download the Joanne Fabrics app! You can use multiple coupons on one purchase. Sewing your costume is the tricky part; make sure you take measurements throughout the process, and take notes on your drawn-out plans from earlier. This will be time-consuming, but no great costume was ever easy! Amazon is a great place to find cheap but great-looking cosplay wigs! They are usually available in any color you will need. Rose Beauty Supply is also a good place to look here in Erie; you can find natural colors also at an affordable cost! TIP: Don't buy a wig from Party City or the Halloween stores. They're overpriced and poor quality. Just like costumes, there are easy props and difficult props. 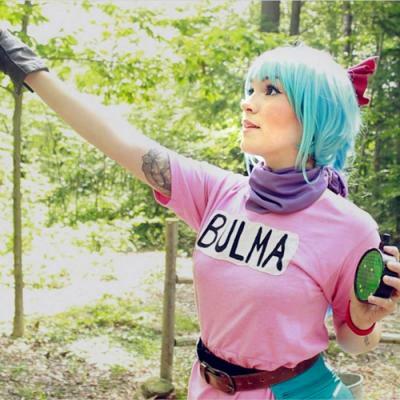 For Bulma, I also thrifted most of my props, but for Kaneki that wasn't so easy. I researched tutorials online for tips and walkthroughs, but a lot of it was still guessing and learning as I went. Foam is a beautiful thing though. When heated with a heat gun, you can change the shape of craft foam, EVA foam, or even pvc pipe. My kagune tentacles took me about three weeks to make, but all of the materials used were made from heated PVC pipe, expanding foam and craft foam! Watch YouTube tutorials; trial-and-error is the best advice I can give.